In April this year I wrote a text piece and manuscript for a play called “In Godot’s Waiting Room” in collaboration with dramatist and Gritt Uldall-Jessen that was performed in the space for contemporary art at the Opera House in Umeå. We have both been active in the queer-feminist community in different cities for many years and the piece came out of the idea of making a feminist re-writing of Beckett’s “Waiting for Godot”. It combines text from “Waiting for Godot” with that of a diary written by about 50 women who squatted a house in Umeå in 1983. The demand put forward by the women, who ended up occupying the house for more than three months, was to get support form the municipality to set up a Women’s House that could also serve as a Shelter. 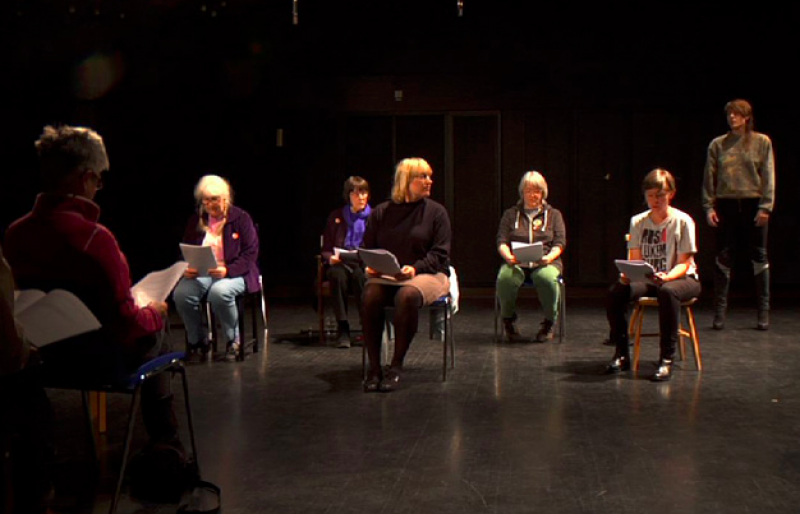 The text piece was performed once as a staged reading with three of the women who took part in the squat almost thirty years ago, Gritt Uldall-Jessen and myself. Artist Malin Arnell performed as the tree. Almost immediately after we had finished this work, the Women’s House in Copenhagen, Denmark, came under threat of eviction after nearly 40 years of activity. The municipality wants to renegotiate their contract according to the standards of the commercial real estate market. This would be devastating for the Women’s House that will no longer be able to pay the rent. Measures are already being taken to save the house, which might eventually lead the activists to squat the house that has been home to a diverse community of activist groups since the 70s. Sparked by this event we felt the urge to continue the work that we started in Umeå, which seemed incomplete in light of recent events in Copenhagen. I would like to take the opportunity that the Visible Award offers to make a new collaboration with Gritt Uldall-Jessen together with the Women’s House in Copenhagen in order to produce an ACT II. This will not only be a wholly new work, but also a way to recontextualize “In Godot’s Waiting Room”. ACT II should be understood as an urgent response to a concrete situation – the threat to close down the Women’s House. It is a dialogue, an investigation and an archive that will be built on participation and activity that is intended to offer another axis of engagement. The piece will use the everyday experiences of the activists; the discussions, monologues, speeches, actions, demos and documents in their struggle to secure their future existence. Our approach is informed by Augusto Boal’s “forum theater,” where fiction is understood not only as a way to reflect on the past but also as a way to prepare for the future. But ACT II will not only be a documentation of a collective struggle, or the representation of a certain group of people at a specific time. It will affect its object. The project itself will enable, not only a certain discourse and engagement, but also the means to produce flyers, banners and printed material needed for appealing to the public opinion as well as to the politicians of the municipality. The course of events concerning the future for the Women’s House in Copenhagen will not only have consequences on the outcome of the project, but the project itself will affect the very same struggle. In my work I’ve been investigating how narratives are constructed and mediated in relation to questions of political representation, history and identity, as well as how they relate to the medium itself. I’m interested in how collective ‘agency’ can be constituted beyond normative categories of identity, but also how these are being represented in terms of imagery and language in ways that could potentially move beyond normalizing narratives. I’ve been wanting to find strategies for discussing, not only the organization and representation of public space, but also a desire to locate spaces or instances that open up the possibility of collective transformation. As part of my interest in the creation of communities, their struggle for definition and raison d’être, I’ve been interested in work that balances on the border between the symbolic and the real. Artwork that is not only a representation, but enters into structures of real politics with the aim to alter them.